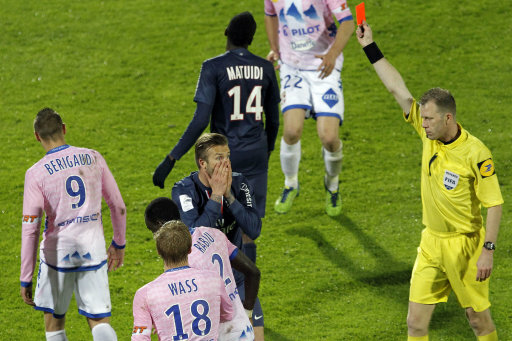 With PSG 1-0 through Javier Pastore and already down to ten men following the dismissal of Marco Veratti for two yellow cards, David Beckham managed to get himself sent-off in inury time against Evain yesterday despite only having been on the pitch for six minutes. Bit of a naff red if you ask us, but you can see why the referee deemed the “stamp” motion to be violent conduct. 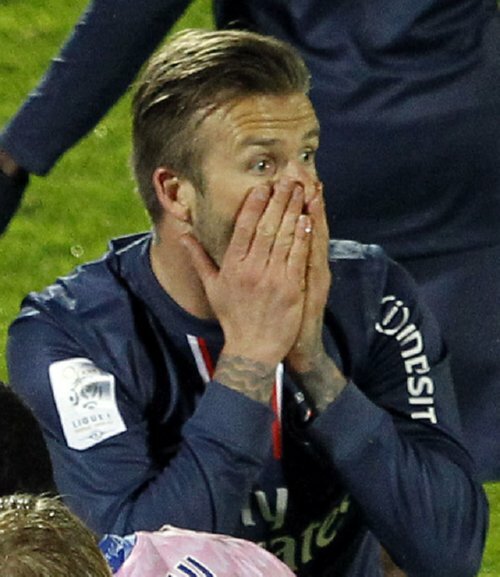 It’s also possible that, from his vantage point and from the player’s ludicrously overwrought reaction, the ref thought Becks ran a stud down the Evian man’s shin/ankle. For the record, PSG keeper Salvatore Sirigu and Evian’s Saber Khelifa were also shown red cards after the final whistle, though the result leaves the Parisien’s nine points clear at the top of Ligue 1 with just four fixtures remaining. I feel like it’s long past due that Becks received credit for his sometimes Scholes-ian tackling. he’s obviously trying to shield the ball, jeez. Becks actually never touched the guy. But I can see how the ref thought he had given the run of play.